These pancakes are moist, light, and fluffy. 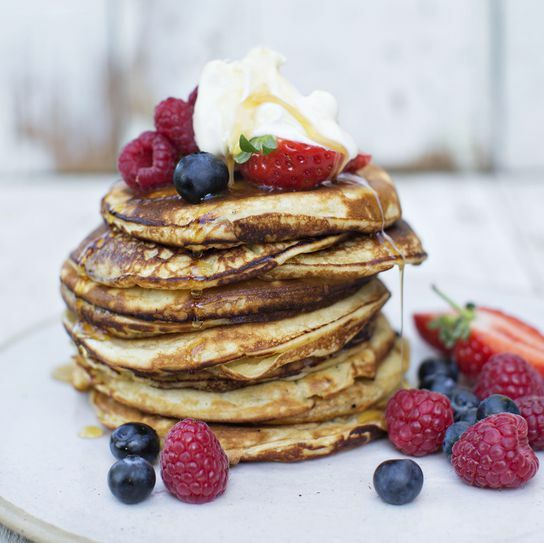 Serve them with fresh berries and a drizzle of maple or agave syrup and top off the stack with some vanilla yoghurt. A breakfast like this will have you off to the races in no time but be sure to do as we do and put a few aside for dessert too! Mix the flour, salt, baking power and sugar in a bowl. Melt the butter in a small saucepan or in the microwave. Place the whites in a clean bowl and whisk to stiff peaks. Mix the yolks with the buttermilk and whisk into the flour mixture, followed by the melted butter. Finally fold in the egg whites. Heat a non-stick frying pan and add a drizzle of sunflower oil. Spoon a small ladle of mixture per pancake into the pan. Cook until the underside is golden, turn over and repeat on the other side. The pancakes may be wrapped in tinfoil and held in a warm oven if necessary. Do you want one of Lynda’s cookery books? Order now from our shop.